Most of this post is a review of your favourite images of mine on Flickr during 2015, with links to the places. But I feel I have to start with my first Second Life video, or machinima, produced for the ‘What Second Life means to me‘ project. 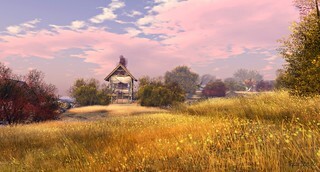 This includes quite few great places in Second Life. What Second Life means to me, Tizzy Canucci on Vimeo. This was the second of twelve machinima this year, never having done any moving image work before (though I had used sequenced still images previously). All are up on Vimeo – just look up Tizzy Canucci. So, on to review the images! I’ve put together 10 places based on your favourite images on Flickr. Where there was more than one image for a place, I’ve put the image links into the descriptions. Links in italics are places and you’ll need a Second Life viewer on your computer to go there. Links in regular font are ordinary weblinks. Cammino e Vivo Capovolto ‘Benvenuto dove nessuno ti vuole bene, dove nessuno ti vuole male…’. Built next to the relocated Ocho Tango sim, it was one of several sculptures by Mistero Hifeng. I thought the photo turned out well – I’d reduced the draw distance to eliminate everything in the distance, and the reflections were just right, but I didn’t expect it to be your favourite for the year! On 29th December 2015, neither of these sims were coming up on search, and Ocho Tango was being turned into something else. Another image at Cammino came in at number 4, ‘Arch Umbrellas’. The shot ‘Ocho Tango Place’ was just outside the 10 but deserves a mention. Elvira Kytori’s Timeless Memories has now been rebuilt with a Mediterranean feel. 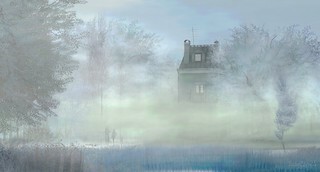 But last winter, this was a great blue-white sweep of frozen landscape. ‘Timeless Sweep’ was also taken here, and came in within the top 10 too. Elvira also runs the White Dunes estate at Tranquility Dreams – this was one of my favourite finds of 2015, ‘White Dunes’ being my own favourite shot here. Salt Water (currently online) is a sim created by Tre (tremeldazis) and Sunshine Zhangsun. It was built next to the long-standing .. with love in her heart .. (now gone) and alongside its contemporary, the moody and marine Isle of Grace (currently not accessible). Failure To Thrive [ The Gray Child ] by Storm Septimus on LEA 15. Unusually, this was not taken on the recommended windlight setting – my fail. I wrote a blog post about this location at the time and it is still open. Baby’s Ear was another wonderful creation by Neva Crystall. It was only open for public access for a short period – for two weeks from the 10th July. The Trace Too changes with the seasons, and this winter’s set up is very romantically Christmas – another atmospheric environment by Kylie Jaxxon. I wrote a blog post on this year’s snow in Second Life that included this sim. Leka by Kate Bergdorf. “A sweet quote from The Colder Water place works on Leka as well; feel free to enjoy this place as you wish”. This is a sim that frequently changes, being the home of Nordan Art, and this was a period while it was scenic rather than given over to artwork. 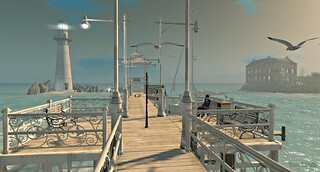 Basilique Town is Canary Beck‘s place in Second Life. Named after the Basilica that dominates the region, it is a small village on a lake nestled between the mountains of Northern Italy. L’Arc-en-Ciel: “The story of life is quicker then the blink of an eye, the story of love is hello, goodbye”. And so it is – L’Arc en Ciel, sadly, is no more. The one place that featured in the review of 2014 as well. 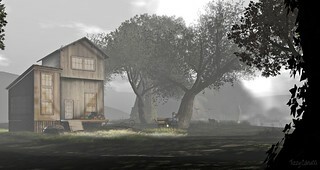 One of my favourite new places in Second Life in 2015. Furillen, by Serene Footman, is an island off the northeast coast of Sweden. Once a limestone factory, now a hotel, it is remote, bleak, beautiful. It has a great music stream. It was also included in my blog post about this year’s snow in Second Life. So, that’s my review of 2015. It’s been a really interesting year, with some great new scenic builds and some fantastic times in the art sites. 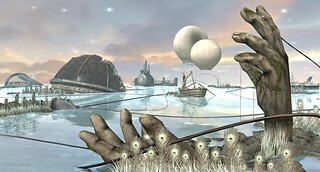 The creativity of folks in Second Life keeps developing, and it remains a fascinating place to be. Here’s to 2016! You are both welcome. I need places to work with, so I’m grateful to you! And as a former modelmaker using solid materials, I admire the ability to put something together effectively.